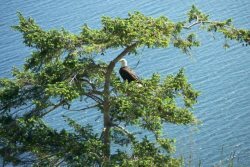 Rest, relax & commune with the eagles in a rustic cabin high on a cliff overlooking the crystal blue ocean of the Strait of Juan De Fuca, on the Olympic Peninsula in Washington State. This 3 bedroom / 2 bath home offers all the amenities for you & up to 4 guests to take a welcome break from your day to day lives & regenerate in a quiet retreat of stunning beauty. Large wrap around deck complete with charcoal BBQ for outdoor cooking, & easy access to hiking trails, the community boat ramp & beach. Full cooking & laundry facilities as well as high speed wireless internet, DISH TV, DVD/VHS players & stereo system. Watch eagles soar & tend to their young in the ancient eagle tree at the edge of the cliff. Luxuriate in the beauty of nature as spotted fawns & their mothers graze in your front yard, hummingbirds’ flit around the lilacs & wild canaries serenade you, all while the ocean breeze drifts in carrying the cries of gulls & the slightest hint of salt air. Watch sail boats lazily explore island coves & crabbers pull in their pots, anticipating the evening meal. Enjoy easy access to endless hiking/biking trails, beach comb to your heart's content, go fishing, or just sit back & take in the panoramic ocean views, Mt. Baker, the shipping lanes & the San Juan Islands. See breathtaking sunsets over the ocean & watch the first lights of Victoria, BC begin to sparkle as night falls. Explore the rustic shops & get-a-ways of Sequim & Port Townsend, enjoy the fantastic seafood cuisine of the area, or take numerous day trips to the surrounding areas either by car of ferry. Visit beautiful Victoria, BC home of the world famous Butchart Gardens, or attend world class sporting & entertainment events in Seattle or Tacoma. Located in Diamond Point, a recreational & vacation enclave centrally located about 20 minutes from Sequim, 35 minutes from Port Townsend & about 2 hours from Seattle. Diamond Point has its own small craft airport & is a quiet scenic retreat from the bustle of daily life. Book your getaway today and build memories vacationing with the eagles at Eagles' Hideaway!